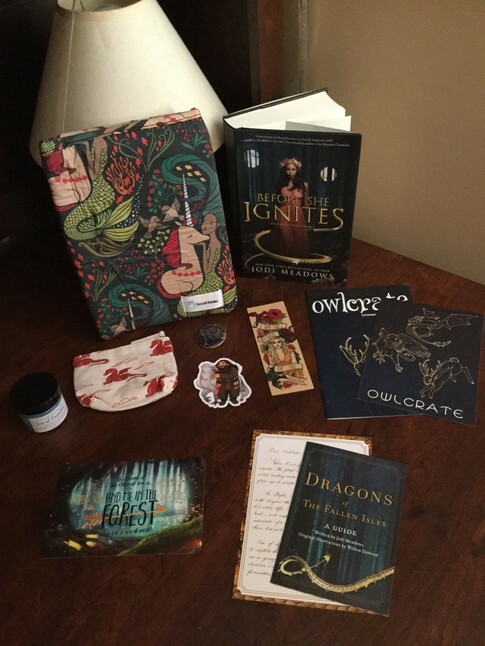 This month's Owlcrate theme was Mythical Creatures and the box was great! There was a lot of awesome things in this box! To start off we have a dragon coin purse to properly guard you change. Next, we have a wooden bookmark with the Mother of Dragons herself on it. For the Percy Jackson fans, a Son of Poseidon bath salt was included that smells absolutely amazing! A book sleeve from Book Beau was given to us to keep all your paperbacks safe when traveling. The Harry Potter item in this box is an adorable sticker of Hagrid and Buckbeak, everyone's favorite Care of Magical Creatures teacher and Hippogriff. The pin of this month features a Gryphon constellation in a starry sky. Now time for the book! This months book is Before She Ignites by Jodi Meadows, which basically about a dragon activist who is thrown into jail. Of course, there are a ton of dragon in this book so I'm totally into it! As always a signed bookplate and a letter from the author were included along with a guide to the dragons featured in the book. The book, as usual, has an Owlcrate exclusive book jacket on it. This box also has an Owlcrate newsletter that has an interview with the author and activities, along with the preview for the next box. The next box's theme is Find Me in the Forest and will have a candle from In the Wick of Time included.